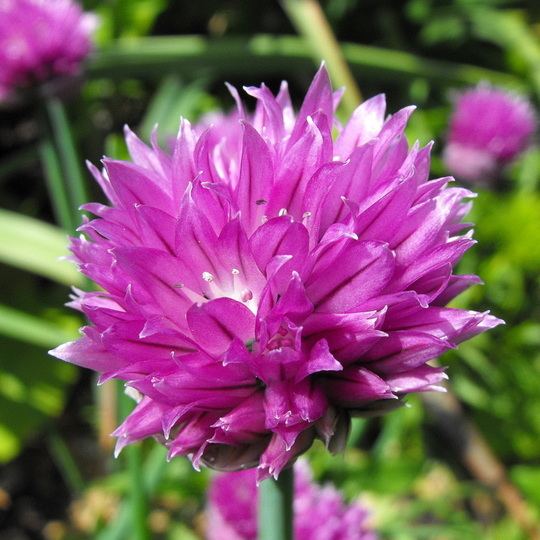 I have chives Jacque - never get to eat them, prefer to see them like this. I have to agree with Dawn. They are so perfect while they last arent they. Definitely. While they last is the question as I don't know where mine have disappeared to. For the last few years they have done really well and this year they have failed to show their heads. Very strange. Still not to worry, I'll get a packet of seeds and next year they should be back. That's a shame Toto :( wonder if it was very cold winter we had. Thinking about it I had a root of everlasting onions - they were like spring onions that grew in a clump and just came up every year with no work on my part- do you know what I mean? I know the ones you mean Dawn, I think that they are also known as Welsh Onions. I expect the wet weather may have done for my chives but never mind I shall re-sow some. I also lost my Platycodon (Balloon Flowers) but fortunately I had collected seed from them last year sow set some more this year and now I have more than I started with. Not sure if they'll flower this year as they are supposed to be biennual. I've been lucky on the mould front Jacque but not so lucky getting them through the winter. Oh dear Toto, its a shame you've lost your Balloon Flowers but looks like you were one step ahead by getting the seeds. Do you know if you can grow the welsh onions from seed Toto? I would love to have them back. Can smell it from here, lovely flower head. This is great Jacque. You really know how to get up close and personal. Lovely photo! !